The new Van Ness Bio-Filters contain a special blend of Nitrobond and Algaecides that attacks and removes the excess nitrogen from your pond. Excess nitrogen in your pond (created from fish waste, fish food & decaying plant material) is harmful to your fish as well as to other animals that live in or drink from your pond. When combined with the improved bacteria medium and filter pad, a much higher rate of water flow through the Bio-Filter is possible. The result is cleaner, clearer & purer pond water. When clogged or dirty, the top filter pad is easily pulled from the filter container. Simply rinse the pad and return it to the container by pushing the sides under the top lip. Helpful hint: you may wish to keep an extra pad on hand so that you can remove the dirty pad and replace it with a clean one at the same time. The filter is simple to install, as no special plumbing, sump box or construction is required. To install the filter in your pond select a location on the bottom that can be reach from out side the pond, place your submersible pump next to the filter and connect the filter to the pump's intake port with a hose (if you are installing an out of pond model the hose connects to the discharge port of the pump). * Note: The new “Outside the Pond, Overflow” Bio-Filter offers the easiest maintenance of all, as well as the added benefit of the relaxing sound of falling or cascading water. When cleaning the filter pad do not remove the filter box from the pond (as the bacteria base will be lost if box is emptied) simply pull the pad from the box, rinse and replace. In a new pond we recommend that the filter pad be cleaned twice a week for the first three weeks, then once a month thereafter, or as needed to maintain the water flow. In established ponds with green water we recommend that that the pad be cleaned daily for the first three days, then twice a week for the next three weeks and finally once per month thereafter or as needed to maintain water flow. For optimum performance, the Pads and Nitro-Bond will need to be replaced approximately every 12 to 18 months. (When placing a new or refilled filter in your pond it may have a tendency to float, place a rock or brick on it, till it loses buoyancy). The Van Ness outside filter is preferred by many due to it's ease in cleaning. With this filter you simply lift the lid and remove the pads to rinse. Then replace the pads under the bags of nitrobond and your filter is ready to clean your pond again. You don't have to get down on your knees and reach into the pond or put your boots on to get into the pond and remove the pads. Another advantage is you don't have to turn off the pump. We suggest the S1200 submersible pump with this filter. Pump will require strainer. In-Pond Filter 3500 - 5000 gal. 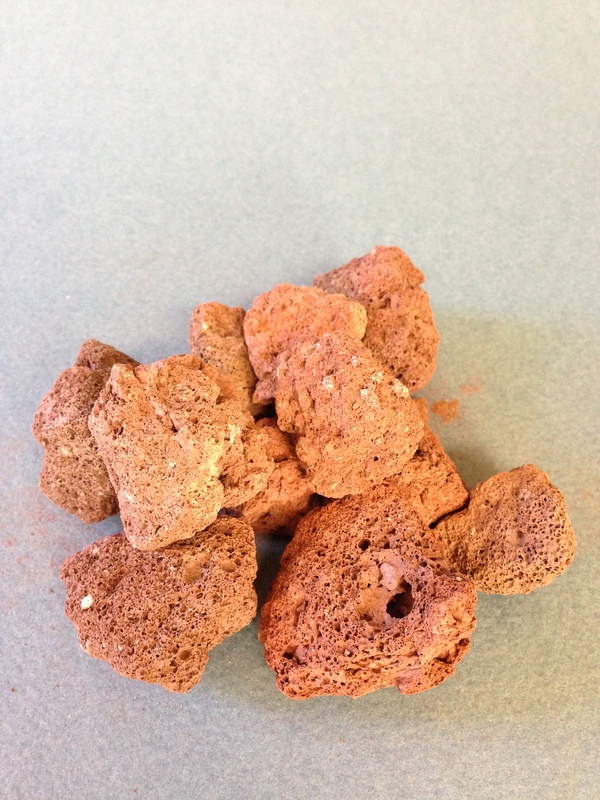 3/4" 14 3/4" x 13" x 5 1/2"
Highly porous lava rock for use as a bacteria medium, in bio-falls, sand filters and other types of biological filters. Clears water naturally removes the ammonia from the chloramine, leaving the free chlorine to dissipate. Clients in chloramine areas should use one pound of NitroBond per 100 gallons of pond water, every six months in their filters. Clients without filters, should put NitroBond in an area where it will get the closest contact with tap water. NitroBond efficiency should be checked monthly with the Ammonia Test Kit. 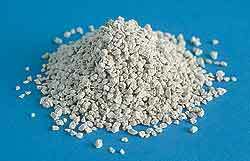 The time that NitroBond is effective will be determined by the amount of free ammonia in your pond (usually 1 year). This high rate sand filter designed to operate for years with a minimum of maintenance and when installed, operated and maintained in accordance to these instructions, it will provide years of trouble free operation. Algae and dirt is collected in the filter as the water flows through the control valve at the top of the filter and is directed downward onto the top surface of the filter sand bed. The algae and dirt is collected in the sand bed and the clear water flows through the center pipe into the control valve at the top of the filter. Clean water then returns through the piping system to the pond. The pressure will rise and the flow to the pond, will be lowered as the algae and dirt is collected in the filter. Eventually, the filter will become so plugged with algae and dirt that it will be necessary to perform the backwash procedure. Backwash at least twice a week, for no more than 15 seconds. As a minimum, you must be sure that your system, will turnover the total volume of water in your pond at least twice in a twenty-four hour period. Clear water is the result of proper filtration as well as proper water chemistry. Set-up instructions are shipped with each filter. 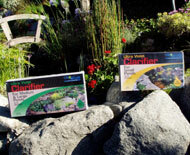 We have 3 UV lites offered at Van Ness Water Gardens. There is a 9 watt for ponds up to 500 gallons. A 18 watt for ponds up to 3000 gallons and a 36 watt for ponds up to 4000 gallons. The UV lite serves several functions in the pond. Number one the UV lite is a sterilizer. It will remove fungus, parasites eggs, bacterias, that are harmful to the plants and fish. Number 2 is will kill algae bloom and algae spores cleaning up your green water problems. The UV lite may be added to the pond pump. Most installations do not require special tools. 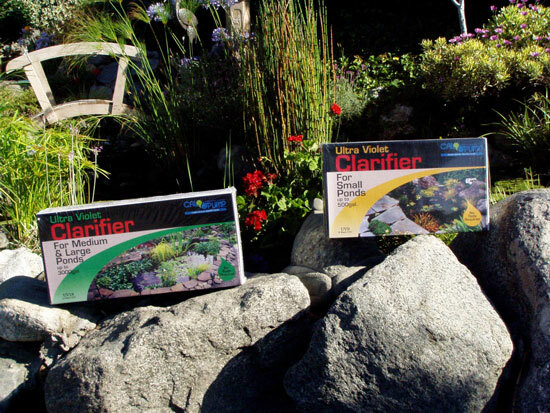 These fast and easy to install UV lites will help keep your pond clear and problem free. These UV lites may also be connected to a bypass on larger pumps. Recommended running time per lite in an average pond is 8 hours per day. The lite may require a separate timer.